Our mission is to bring toys to the future of personal manufacturing and 3D printing. – ToyFabb delivers a specialized, comprehensive, convenient and integrated 3D Printing B2C and B2B platform for kids, parents, designers and toy manufacturers. Our mission is to provide customized, extraordinary, individual and safe toys using digital creation and 3D Printing technologies. Digital 3D design and 3D printing technologies are ideally suited for the creation of toys where creativity, customization and fun create consumer delight. On our online platform, everyone can search for and buy digital designs in different categories and print them with his own 3D Printer at home or via a 3D Printing service provider nearby. 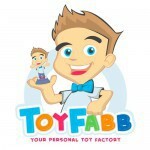 ToyFabb encompasses the industry value chain from a copyright protected marketplace and payment platform for 3D toy designers, manufacturers and creative consumers to the safety and quality assurance of toy models, recommendation of required materials and printer settings, and the production of toys on a consumer 3D Printer at home or a 3D printing service. We are convinced that the digital production and 3D Printing technologies will contribute significantly to a new generation of toys more fitted to the consumer, and in general to safer and more creative toys. Last but not least, it will contribute to the reduction of our carbon footprint by producing toys only on demand and locally on any 3D Printer nearby.